Tightening the defense, which is a priority as a hot Utah team comes to town. The Jazz beat the Houston Rockets and the New Orleans Pelicans in the first two games of their current four-game road trip, shooting 52.3 percent from the field in a 132-111 victory over the Pelicans on Saturday, their highest scoring game of the season. Donovan Mitchell, who leads the Jazz in scoring again this season, has 60 points on 21-of-35 shooting in the last two games. Center Rudy Gobert was 11 of 13 from the field against the Pelicans, who played without Anthony Davis. Mavericks opponents have shot 49 percent from the field in five games this season, 27th in the league. Opponents also have shot 48 percent from 3-point range, which ranks last. "Our defense to start the game has been ... what's a 'G'-rated word?" Jordan told reporters after the Mavericks lost 116-107 on Friday at Toronto. The Mavs, who are 2-0 at home, have lost their last two games entering their first meeting of the season with the Jazz on Sunday. Utah won all three games in the series last season. Dallas started well against Atlanta before failing to hold a 26-point, second-quarter lead in a 111-104 loss Wednesday. The Mavs gave up 69 points in the first half of the loss to the Raptors and trailed 18-2 and 39-22. The 6-foot-11 Jordan has shown why the Mavericks went hard after him three years ago and finally were able to connect with him this offseason. He became the first player in franchise history with double-doubles in his first five games after getting 18 points and 15 rebounds Friday. He also had five assists. Jordan appears to have made the hack-attack a thing of the past. Frequently fouled on fourth-quarter possessions because of his iffy foul shooting with the Los Angeles Clippers, Jordan has made 22 of 26 free throws this season (84.6 percent). He is a career 44.9 percent foul shooter. Barnes had 14 points, six rebounds and three assists in his return to the lineup at Toronto after missing all of the preseason and the first four regular-reason games because of a hamstring injury. He led the Mavs in scoring in each of the last two seasons and made a career-high 119 3-pointers last season. "My job is to go out there and be aggressive offensively and defensively," Barnes said. "I pretty much am used to adapting, so I don't see my role changing too much. The rhythm will come." The inevitable rust showed Friday, when Barnes was 5 of 17 from the field and made 1 of 5 3-point attempts in 28 minutes. "He's a high-level player that we haven't had," Dallas coach Rich Carlisle told reporters. "He's a guy you can throw the ball to and he can create. Not having him has been tough. Any time you bring a guy back after basically sitting out a month, to get his rhythm is going to take awhile." The Mavs may finally put their anticipated starting five on the court against Utah. 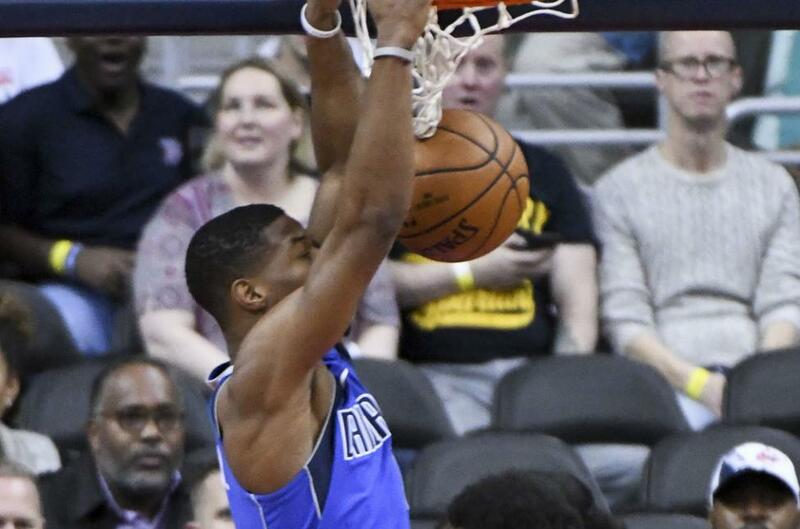 Point guard Dennis Smith Jr., who did not play against Toronto after suffering an ankle injury against Atlanta, is listed as probable. Doncic had 22 points, the rookie's third 20-point game in the last four, to go with five rebounds and four assists against Toronto. He matched a career high with four 3-pointers and is averaging 22.0 points in the last four games. Doncic appears to be a top early candidate for rookie of the year, following the path that Mitchell went down last season when he finished second in the rookie voting behind Ben Simmons. Mitchell, averaging 23.4 points per game this season, had 38 against Houston on Wednesday. He told reporters afterward that he was "110 percent frustrated ... not so much from the scouting aspect. Just because I wasn't making the plays I need to make." Gobert, the reigning NBA defensive player of the year, is averaging 16.6 points and 13.0 rebounds per game. Like Jordan, Gobert has a double-double in all five games. The two are in top five in the NBA in field goal percentage and in the top 10 in rebounds.